Aviom will be introducing its Pro64 Network Manager PC application at this year's InfoComm, June 17-19. While the Pro64 Series is uniquely designed with a simple, front-panel user interface that makes it possible to design sophisticated networks without PC-based programming, the company is introducing a software control application this year for those users who desire centralized control and status monitoring. 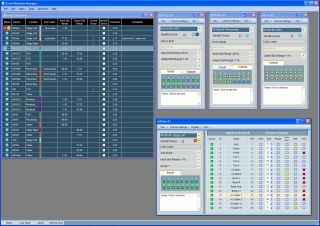 This new easy-to-use graphical interface provides global and device-specific information to the user, allowing simple management of even complex audio networks. With Pro64 Network Manager, users have remote control of every Pro64 device in a network using a PC connected to the I/O module set as the Control Master.